For £15, tastings don’t get a lot better value than this..
C: The best one of the first 3, rich and nicely balanced. Caol Ila performing well as always. T+F: Sweet ‘n’ meaty, oily, limes, lemon oil, big herby thing developing – had a complexity beyond its years. C: This was a lovely Kilchoman, one of the better ones I’ve had. It was released just before the Feis began, but was thought by many to be better than their official Feis bottling. It was peaty and really nicely balanced, and seemed to improve with each taste. T+F: “So complex!”, apricots, hay, meat & gravy, diesel, dry, fried onions. C: Oh my word – this was the winner hands down, for us, but not the whole room. Its age added so much beauty to what I know of Lagavulin, I was at peace with this in my hand. It had such woody complexity and a background balance of peat that really struck a chord. I’ve got a feeling this might become one of my favourite whiskies ever, as the memory develops. The Lagavulin 1991 24yo – it really was superb. T+F: Sour, biscuits, light Bovril, beef, sherry and light oak. C: The richest of the lot, this would stand out at most tastings. Biut in this company, it didn’t quite have the wow factor to compete for the top spot – fun. 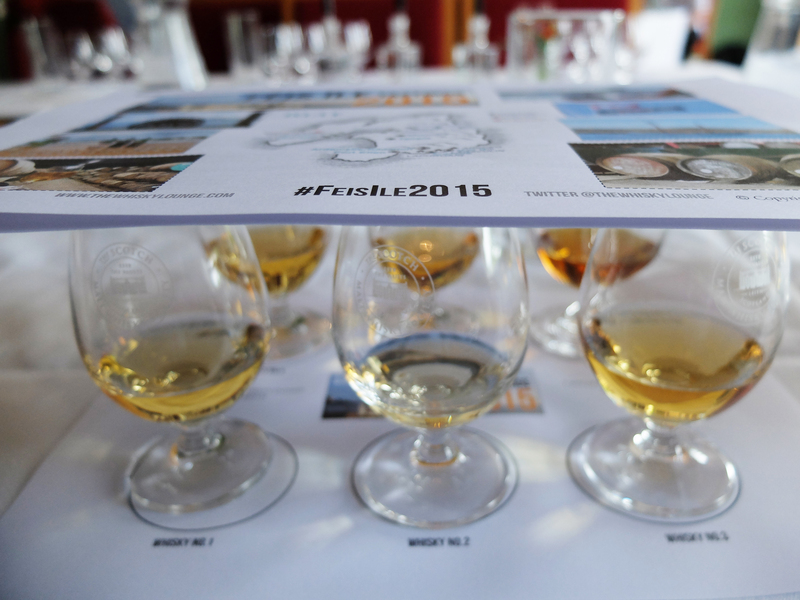 We then had another 45 minutes back at the festival, where a really good range of whiskies had been organised (unlike another recent festival). 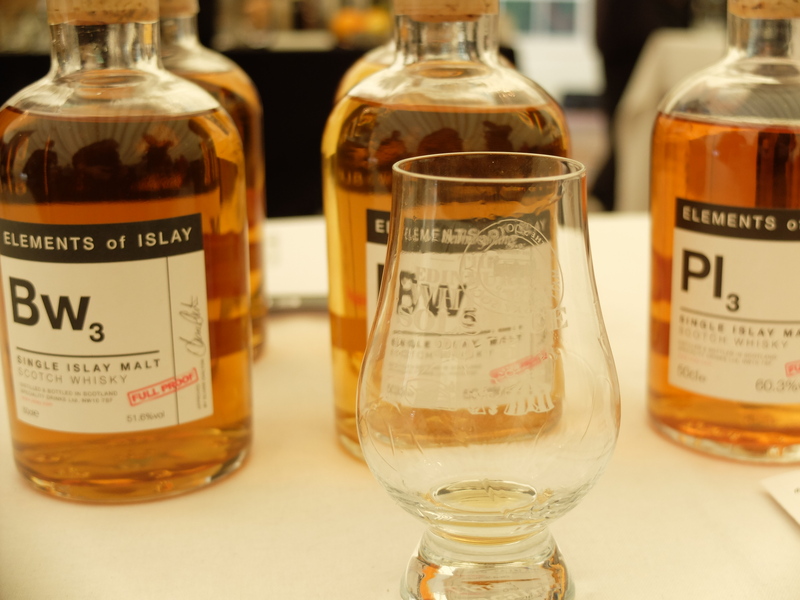 Berry Bros had brought 9 single cask bottlings with them (and a Blue Hanger), and there was good representation from Douglas Laing, Amrut, Benromach, Springbank and a lot more (including new Elements of Islay bottles, below:). 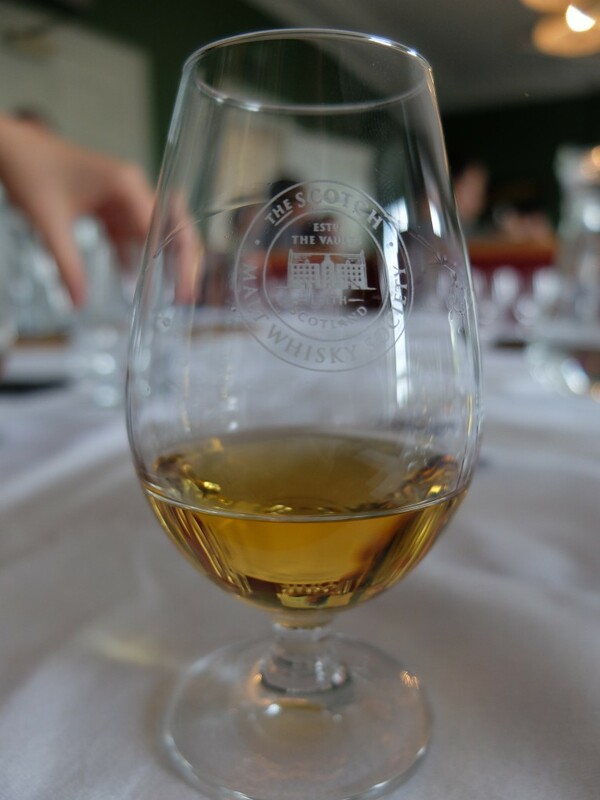 Even the SMWS whisky ice cream was great – and as far as I noticed, no one fell in the pond. I’d not tried the Pl3 (Port Charlotte) before – it was big and rubbery. 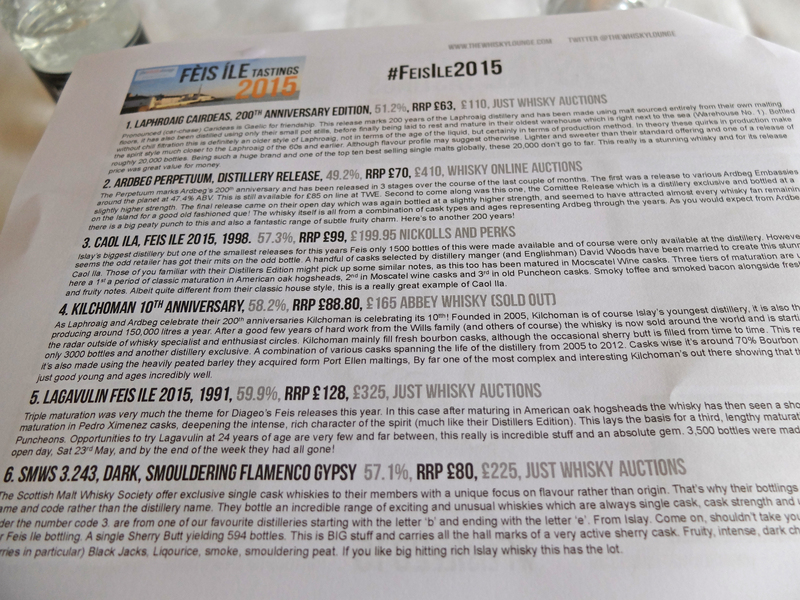 The Lagavulin Feis Ile bottle was easily the best thing I tried all day, but as far as bottles from the festival go, I was probably most impressed with the Amrut Peated cask strength – it had a beautiful rose-tinted peatiness to it, delicate and well-balanced. I was thinking it was a £40ish bottle though, and turns out it’s a bit pricier than that. The new Longrow Red was back to the glory days of the first release for me, another cracking red wine finish. And in the gossip corner, I got the guy from Benromach to hesitate long enough to suggest that a 100 proof version of the Benromach 15yo is on its way – excellent news. This entry was tagged 2015, ardbeg, bowmore, caol ila, feis ile, feis ile 2015, kilchoman, lagavulin, laphroaig, whisky, whisky solstice. Bookmark the permalink. ← My Worst Whisky? The Stramash creates a new low.